There are a number of reasons as to why the great helm earned its name, although the least of which is probably because helms like this Over Wearer Great Helmet made the wearer look like a great, powerful, and intimidating warrior or knight. 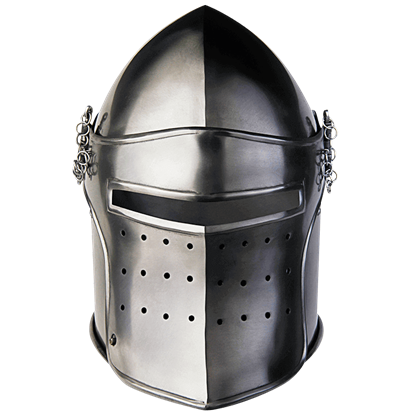 Modeled after the typical knights great helmet, this impressive helm has a cylindrical shape that wraps the wearers head entirely in metal, providing almost total and complete protection to the head. The rounded top helps to deflect blows off the sides of the helm, while the riveted band along the edges adds a bit of reinforcement, making the helmet stronger along its seams. The front of the helm features a decorative cross display, which also features narrow slits for the wearer to see through, as well as cross-shaped air-vents to help ventilate the helmet (while also allowing the wearer to breathe easier). 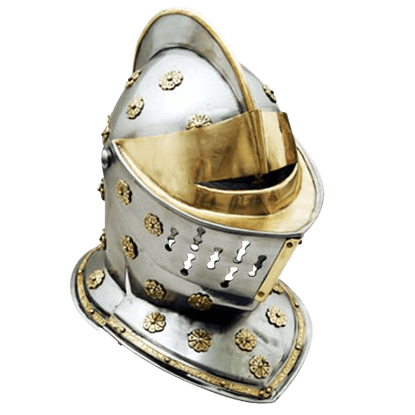 This helmet is made from high quality metal and is designed to replicate the appearance of ancient medieval helms. 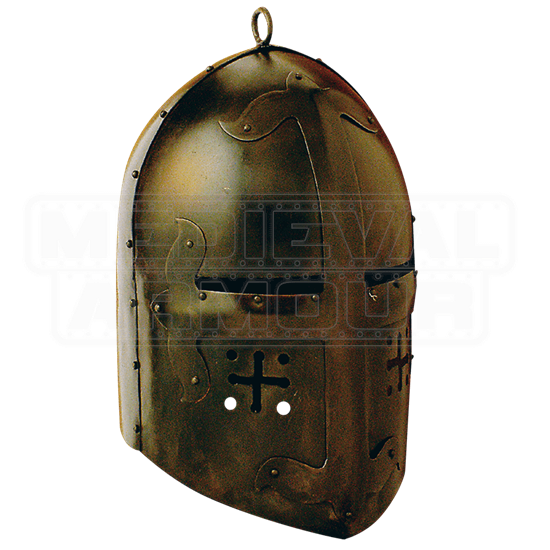 Not only would the Over Wearer Great Helmet make a great decoration in your home, mounted atop a nice helmet stand like a piece of medieval memorabilia, but it would also be a fantastic accessory to wear whenever you plan on donning the attire of a true medieval knight. 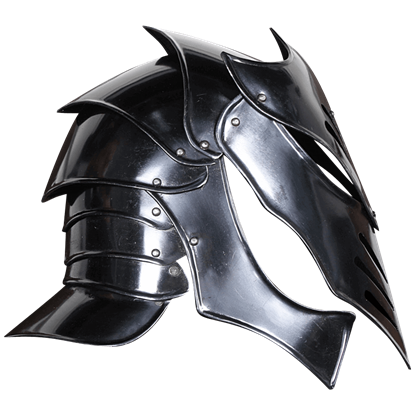 One look at the Gothic Sallet Helmet - Dark Metal Finish, and it is easy to see why the sallet was one of the more common helmets of the Middle Ages. Not only is this helmet protective, but also visually pleasing as well. The evil queen has sensibly chosen you as her dark right hand. None can stand against your deceitful cunning and deadly skill. You fortify yourself in the malicious style and wicked strength of the Reginald Darkened Steel Helmet. The peaceful kingdom faces ruin once again. Another dragon terrorizes the townsfolk. Duty calls the gallant knight to face the monstrous beast. Face your fierce opponent while wisely cloaked within the Magnus Visor Steel Helmet. The Crusader Great Helm was developed early in the 13th century. The Great Helm became the mainstay of the medieval fighting man and lasted for about 300 years. 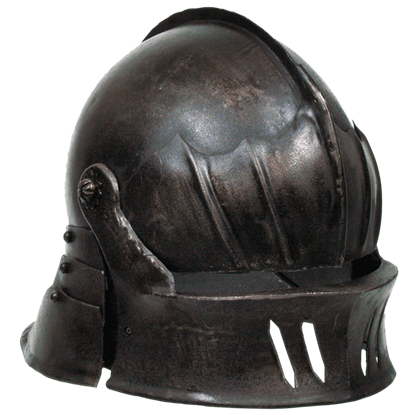 The Crusader Great Helm is made of high carbon steel and fully wearable. 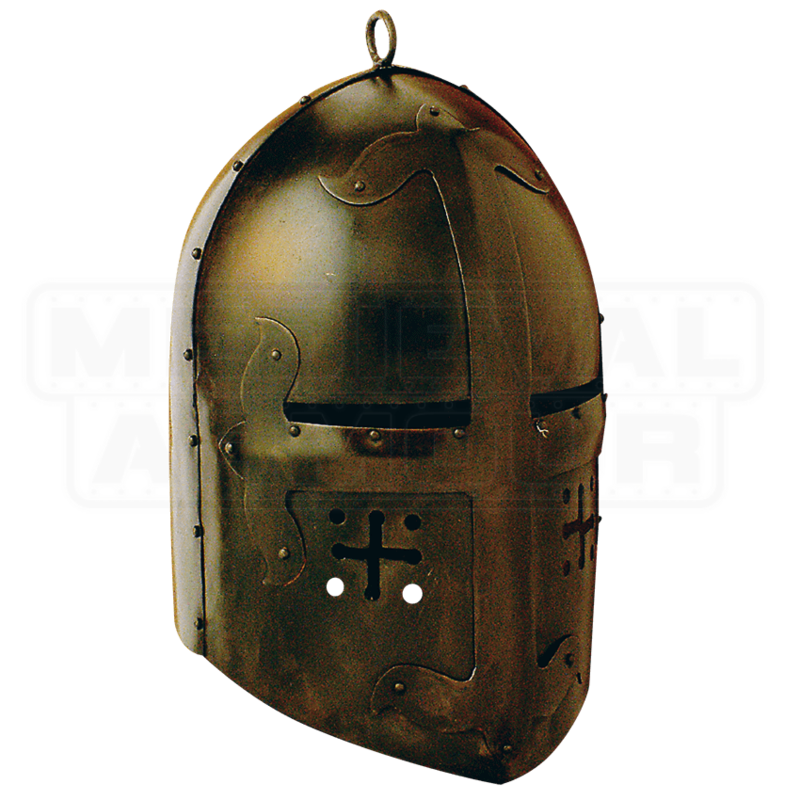 The Golden Knight Helmet is from around the 16th century. This beautiful museum quality, late 16th century replica is full sized and ready to wear. 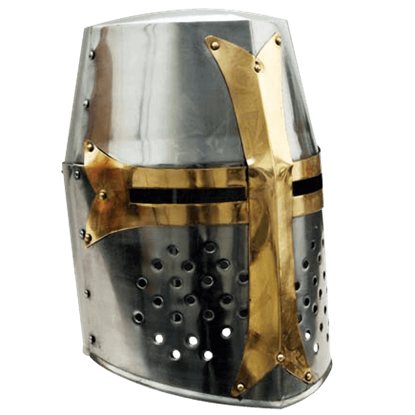 The Golden Knight Helmet is hand made of high carbon steel and fully wearable.